Our company is a startup formation of the TU Berlin. We are your specialist for innovative tribological engineering services and measurement devices. Our simulation method in the field of polymer friction is worldwide unique. It is the first quantitative simulation method for the calculation of friction forces in polymer contacts. Due to our simulation method, you get the possibility of carrying out material and functional optimizations fast and efficiently. It allows you to use friction effects constructively. You get additional insights and understanding of friction processes. We can analyze every custom-specific problem scientifically and work out complete solutions in our modern laboratory. 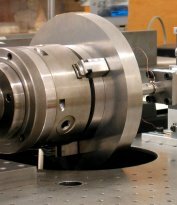 The Express Rheometer developed by us detects all relevant characteristic parameters of friction contacts. You benefit from our services when you produce, operate or use technical systems in which tribological aspects like friction, wear, lubrication or contact mechanics as well as vibrations play an important role.